MSP Weddings | 2019 Spring / Summer Issue! Last March I hopped in a car and drove up to Ely Lake, MN with a bunch of friends to photograph a project for Bill Damberg and his store, Brightwater Clothing. Brightwater is a fantastically curated store in Excelsior, Minnesota and for this shoot, we travelled to Bill’s family cabin to set the scene. This shoot was magic and here’s why - to be honest, there wasn’t a lot of production. There wasn’t a lot of thought, but there was intention. The idea was simple - lets get some rad people together and they can all do what they enjoy best. Lets document a brilliant day on the lake and see what happens. What happened was one of the most organic and beautiful shoots I had all year and I’m so happy to say that the 2018 / 2019 Winter Look Book for Brightwater is now live! Below are some of my favorite spreads and some fun behind the scenes! I was happy to photograph the new look book for NEAL Jewelry's latest collection, NOVA. The brand, formally known as Carrier Pigeon, just relaunched as NEAL Jewelry and with this, came a whole new look. Liz Gardner of Bodega, ltd. had a huge part in both the concept and styling of this shoot, where much of the inspiration came from the new colors of NEAL + the 90's. Mom jeans, Linda Evangelista, all of it. Heather Byington was our talent and Romeny Chan lent her talents for all of the hair + makeup. Below are some of my favorite images from the shoot, along with some behind the scene photos. Every year, I am so grateful to be invited back to photograph the newest collection by bridal designer Tara LaTour. Tara and I have a beautiful working relationship and friendship, and I remember last year when we were at Bridal Market, she was already planning this year's designs. For this past year, she stuck to her vision and her 2014 collection has stayed true to her brand's roots, while pushing the limits in the details. The dresses have elements of fringe, separate pieces, and cropped tops, which is something I just adore for the world of Bridal. A few of her dresses, in my opinion, are also red-carpet-worthy. As usual, Tara included her classic ombre and color dyes to the line. On a personal note, I am totally and completely honored to have a dress named after me!!! This is one of those moments in life where I am completely humbled that she felt a dress was inspired by my personality. That is truly amazing. For this year's look book, we went into the studio for a more editorial and monotone look to the images. Amber Rose gave her talent to the hair and makeup - and even went so far as to give our model hombre hair, which I absolutely love and think it fits the Tara LaTour brand absolutely perfectly. Each year, Tara and her team put their heart and soul into creating this work, and it is such a wonderful thing to be a part of. I am currently sitting in NYC in the midst of Bridal Fashion Week, where Tara is debuting this collection. I felt it was the most fitting time to share it all with you as well! Of course, a shoot like this would not be complete without some fun behind-the-scene images! Thank you so much to our entire team for all of your amazing work! I love personal work, test shoots and collaborating with other fabulous artists. A few years ago, I struck gold with a NAHA submission and learned a TON about the hair & makeup industry, along with what-it-takes to submit to this prestigious competition. NAHA stands for the North American Hair Association and the awards they give out are like the 'Grammys' of the hair+ makeup industry. When Amber Rose approached me about wanting to submit, I was absolutely 100% in. This girl had her concept down to be a dark, high fashion shoot, and incorporating certain accessories - bones, long, creepy nails, a nun wimple and veil - you know, the usual. We brought in the fabulous designer + art director, Liz Gardner, to help us with the layout and along with clothes from Emma Berg and Cliche, the team was complete. Julie Lam assisted Amber Rose with the hair + makeup and Agnes Xiong was our model. We are all incredibly busy people, so this shoot had to happen in our 'off' hours. I think we wrapped close to midnight or 1am? Either way, totally worth it. We actually didn't make the cut to be finalists in this competition, but I am a believer in submitting to competitions, whether you win or lose - the work is always a win. Look books seem to be my jam lately, and I couldn't be happier about it! When it comes to my job, I love working on the 'big' picture. I have learned over the last couple of years that my passion really lies in telling stories and when it comes to working with start-up-companies or re-brands, I have the opportunity to help visually shape a brand. Now, with this comes great responsibility to convey the right message and also to inspire consumers to want to know more and be a part of the company. I love this challenge. I love wrapping my head around the company, its vision and creating work that reflects that! MidNorth Mercantile is a new menswear shop opening up it's first shop in Minneapolis in a few weeks! MidNorth was founded by 'Mustache Mike', who is a barber in town and also has a great passion for finding hidden vintage gems. You name it - clothes, bags, shoes, furniture - the man has curated a serious inventory of some amazing finds. 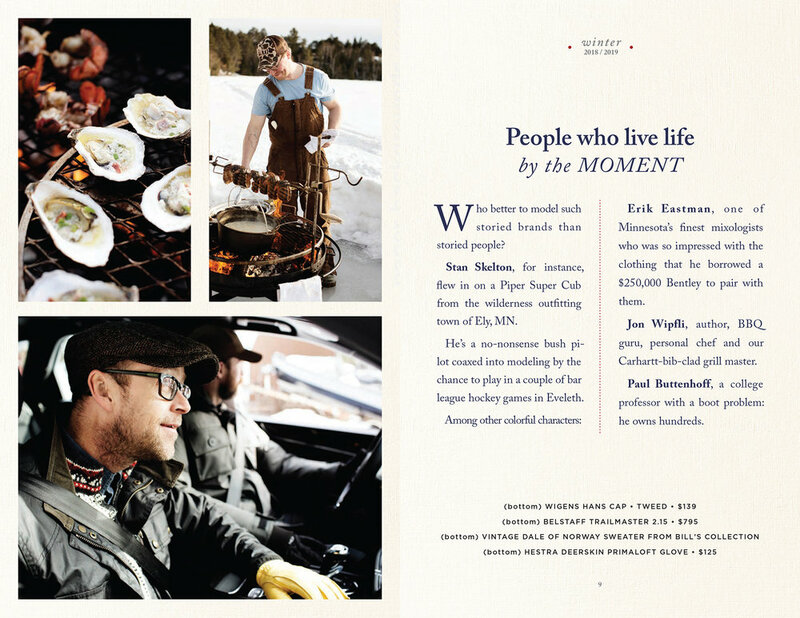 MidNorth Mercantile will be a fusion of both of his worlds. Come in a get a great barber cut, along with spending some time shopping the racks of vintage finds. I've always loved what this company has in stock and when I saw the boys at Northern Grade this year, I decided that I simply had to photograph their fall collection. Thankfully, they believed in my vision just as much, and our shoot together was absolute magic! It was the perfectly overcast day, which allowed for a bit of an eery mood and some nice even light. I want to give a special thank you to our entire crew, who not only made this fun, but absolutely gorgeous. I love photographing menswear, enough said. And just for fun...here are some behind-the-scene photos from our shoot! Design, Processing & Layout: Little & Co.
Every Tuesday, Ceci New York comes out with an online editorial called Ceci Style. I've blogged about these installments quite a bit, but I just had to share the latest cover I photographed with you all! Ceci is a stunning woman, no doubt about it, but these covers go way beyond just making her look good. All of Ceci's covers revolve around an invitation she has designed for a client, the client's event and all of the inspiration that was pulled to create a piece of art. My job is to interpret the mood of this concept, using the correct lighting, direction and posing for our beautiful subject. When we shoot the covers for Ceci, we are always on location in NYC, so time is very valuable to the entire team! We all love working together, and want to make the most of the time we have. Therefore, we always end up photographing 4-5 looks in one day. Tons of work, but so much fun! I just love the way this week's cover turned out! The theme is Art Deco and I chose to use, what I call, a 'Bad Flash' technique, which is basically blasting the subject with direct flash. It's tricky and very simple all at the same time, and I love the contrast that was brought out in this image. Everything about it is great! You can see the complete feature on the Ceci Style website! Of course, many people helped us create this image, so I would love to thank them all!